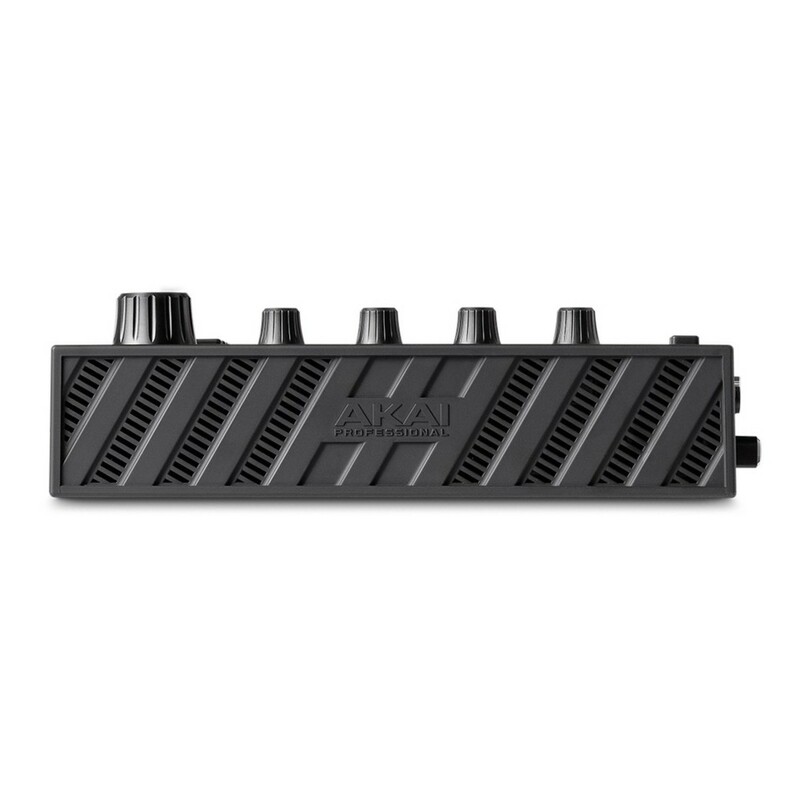 The Akai MPC Live is a compact, standalone music production unit featuring 16 ultra-responsive, velocity-sensitive RGB pads and four touch-capacitive Q-Link controls. 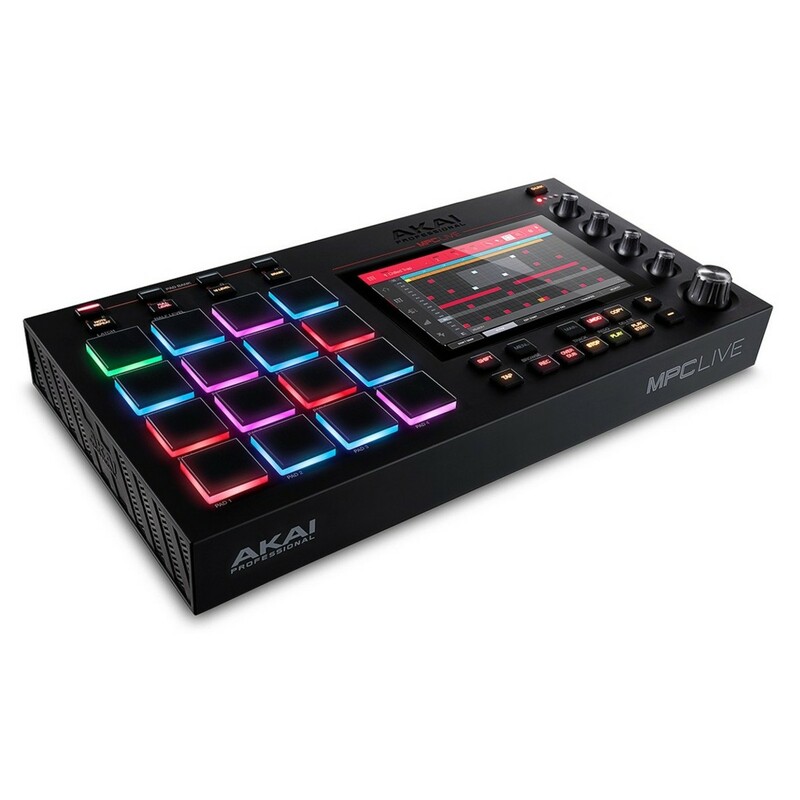 The Akai MPC Live re-captures the essence of what made the original MPCs so renowned, and brings it to the forefront of the modern era. The standalone design means no PC is required, with the unit boasting 16GB of on-board storage (including 10GB of premium sound content), a 7-inch full-colour multi-touch display and two USB 3.0 connectors for connecting flash drives and MIDI controllers. 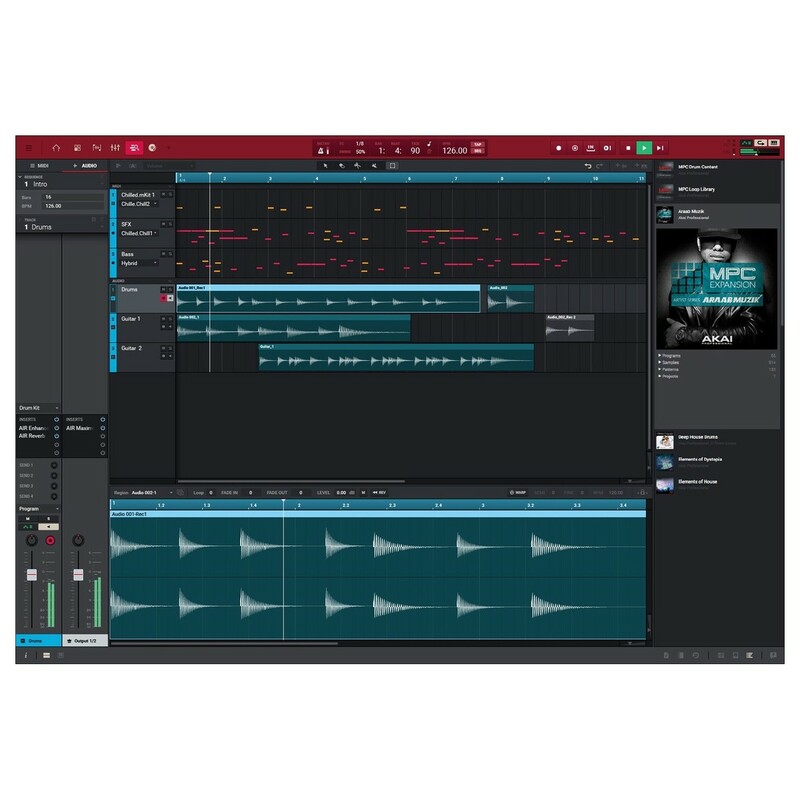 The MPC Live is natively powered by the MPC Software 2.0, giving you everything you need to produce your own music, perfect for a range of genres from Hip-Hop and Pop to EDM and more. 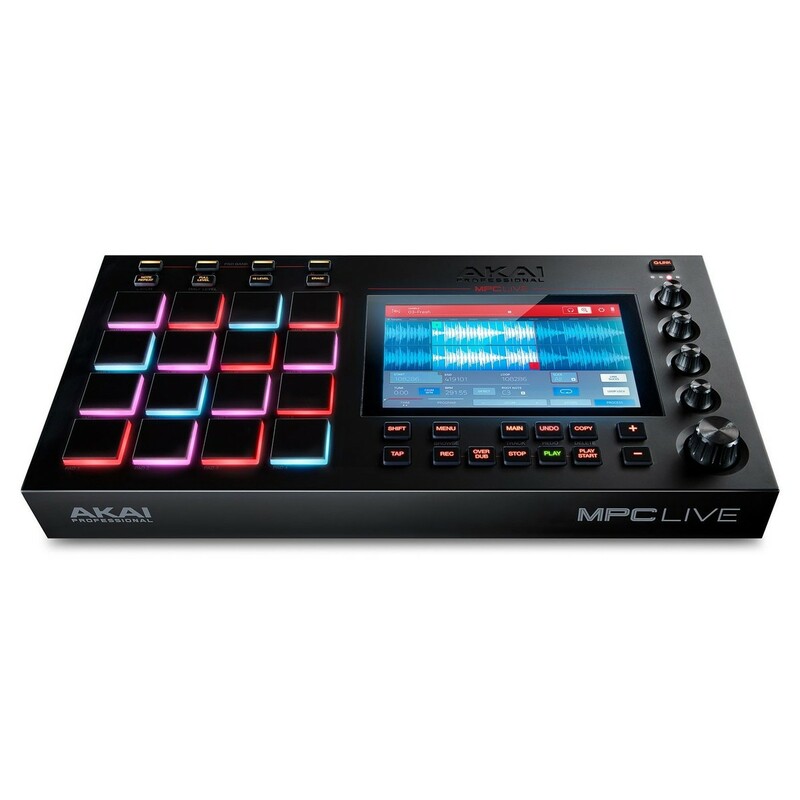 With its ultra-portable design and wide range of controls, the MPC Live is the ultimate solution for mobile production as well as live performances. The MPC Live provides you with a wide range of versatile controls, configured in an ergonomic layout to improve your workflow. The 16 ultra-responsive velocity-sensitive pads are backlit with RGB lights, perfect for performing in low-light environments. As well as being an all-in-one production unit, the MPC Live is also perfect for live performances. The bright and intuitive 7" full-colour, multi-touch screen, provides you with all the information you need on your controls, parameters and levels. At the heart of the MPC Live is the MPC Software 2.0. 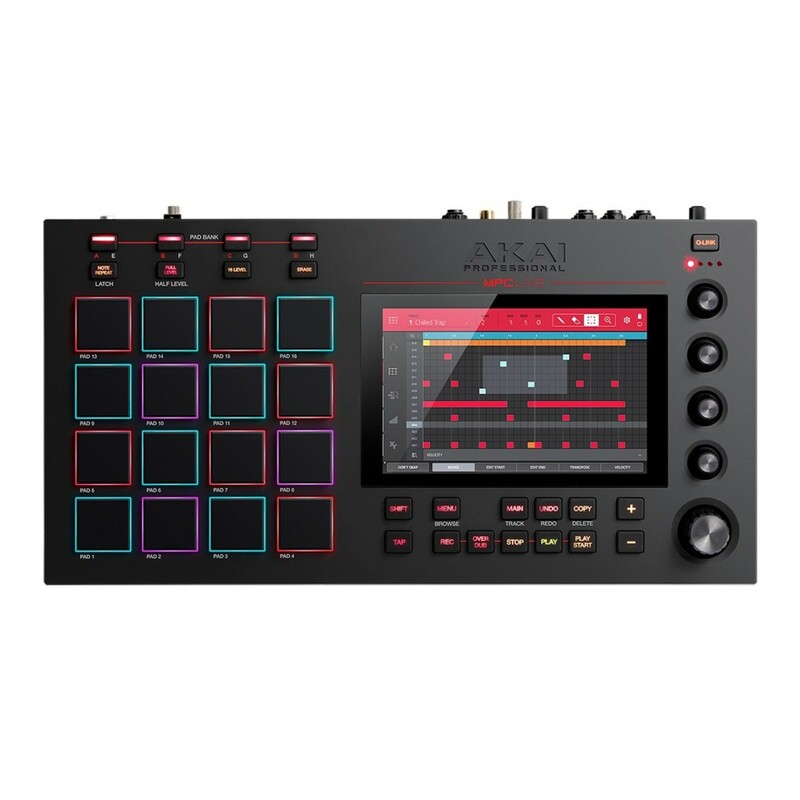 The MPC Sampler features 16 RGB backlit pads and four touch-capacitive Q-Link controls provide you with all the control you need for complex live performances, allowing you to store and trigger sample banks at the touch of a button, seamlessly switching between songs, rhythms and more. 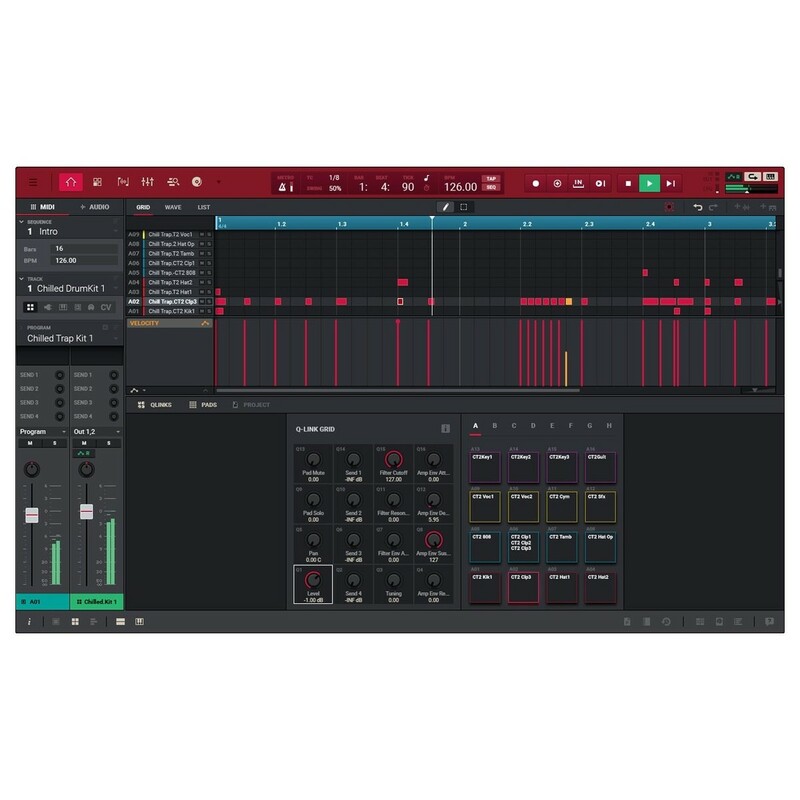 The standalone production unit also features a 2-in/2-out MIDI interface, allowing you to connect MIDI compatible sound modules, drum machines and controllers directly to the MPC Live for unparalleled MIDI sequencing capabilities. 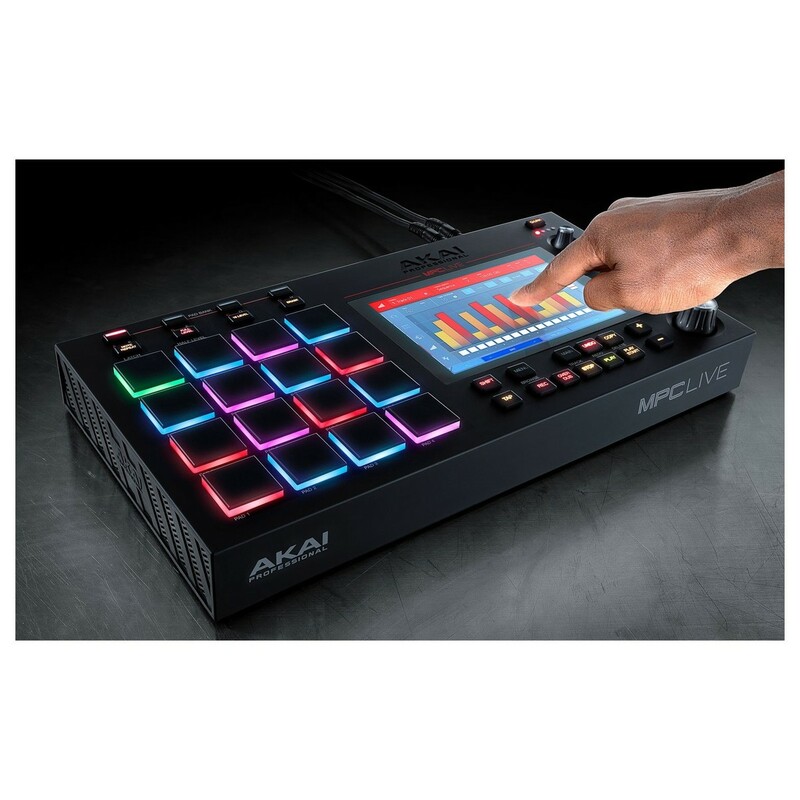 The Akai MPC Live brings the classic MPC design into the modern-era with its standalone design featuring 16GB of on-board storage and a 7-inch full-colour multi-touch screen. The standalone design means no computer is required to operate the MPC Live. Combine this with its lightweight construction (5.5lbs), and the MPC Live is one of the most portable MPCs to date. The MPC Live production unit boasts multicore processing technology as well as 2GB of on-board RAM, allowing you to create rhythms and melodies with ease. The MPC is revered in the music industry for being one of the most prominent production units on the planet, revolutionising the production techniques of early producers. One of the most noteworthy features of the MPC is its ability to sample records and other sources, allowing you to chop and re-arrange samples with ease. With this in mind, Akai have incorporated an RCA input with ground peg and stereo balanced ¼-inch jack for sampling straight from vinyl. The ergonomic layout of the MPC Live makes it ideal for both studio sessions and live performances, while the intuitive touch-screen display allows you to easily access and navigate through sound content, music banks and file information. The internal, rechargeable lithium-ion battery, provides you with more than enough power for portable use, allowing you to setup and create wherever you go. The seamless integration means you can adapt to any situation, from connecting MIDI controllers and sound modules to connecting to your favourite DAW, to control your favourite VSTs and more. MPC Live features a wide range of controls and parameters including a built-in step sequencer, editable waveforms, live time-stretching, sampling, and sequencing. You can also apply XY FX in real-time and use the MPC Live as a control surface for the MPC 2.0 software. 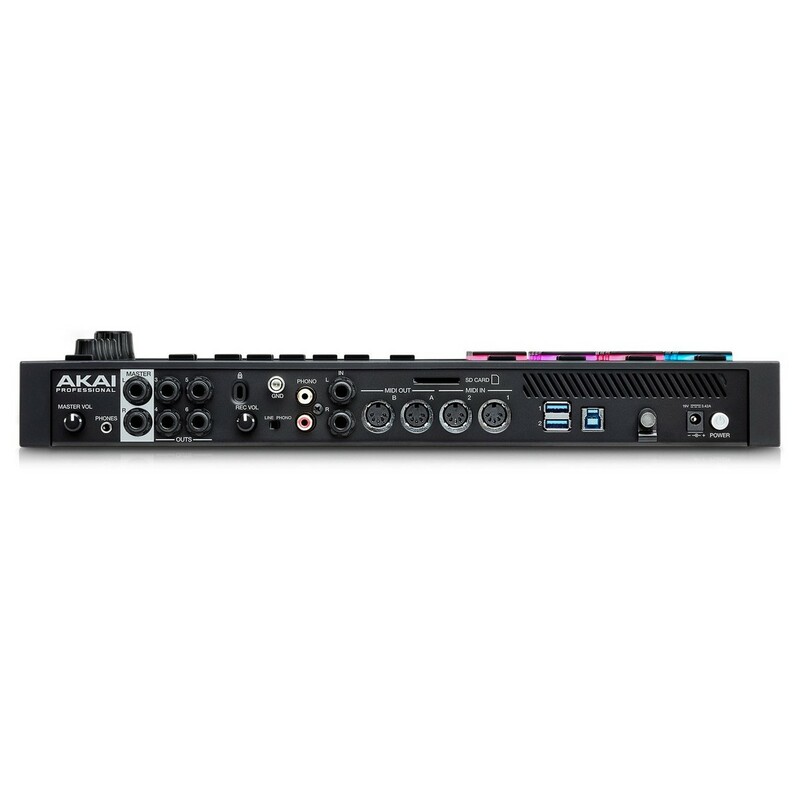 Also included is a range of versatile connectivity from analog to digital including 6 configurable ¼-inch balanced jack outputs, a 1/8’’ headphone output, 2 pairs of full-sized MIDI inputs and outputs as well as an SD Card slot for loading samples and projects. 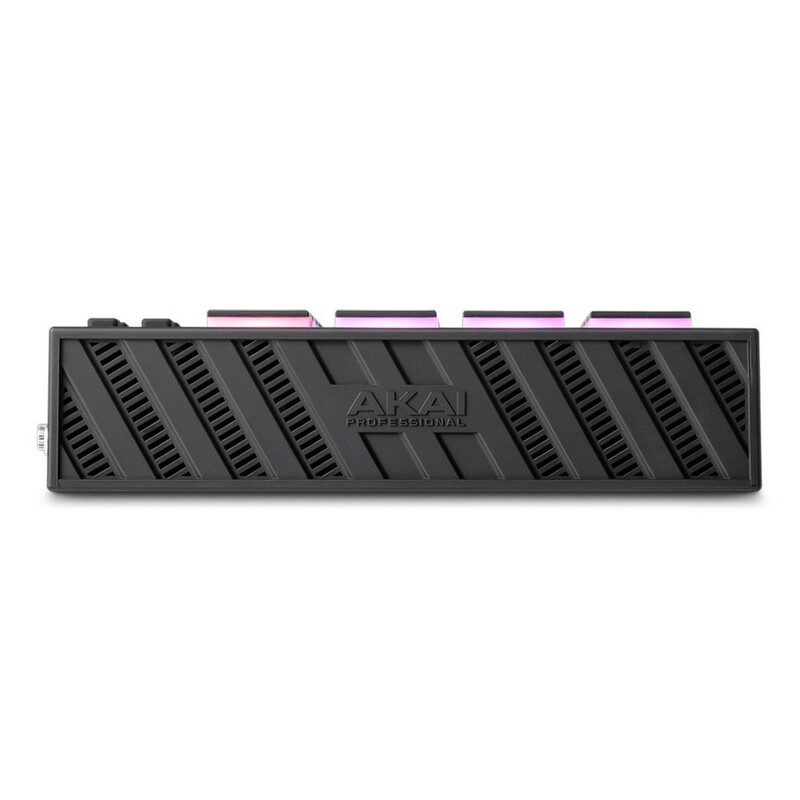 2 USB-A 3.0 connections are including for flash drives and MIDI controllers and the 2.5-inch SATA drive connector allows you to expand your memory with an SSD or HDD for added flexibility. At the heart of the new MPC is the MPC 2.0 Software, driving both the MPC X and MPC Live in standalone and controller modes. The MPC 2.0 Software features a range of improvements and cut-edge production tools including the production suite that combines the 128-track sequencing capabilities as well as real-time time stretching. Other useful features include clip-launch functionality and advanced MIDI edit capabilities for added control. Clip Programs within the MPC 2.0 Software is armed with a unique real-time time-stretching/pitch shifting algorithm with a range of useful tools including automatic BPM detection, Toggle/On Shot launch modes, loop-specific RGB pad colour configurations and more. The lip launching functionality will refine your workflow and unleash your creativity. The MPC 2.0 Software also provides you with up to 8 studio-grade resolution audio tracks in standalone mode or 128 tracks in controller mode.